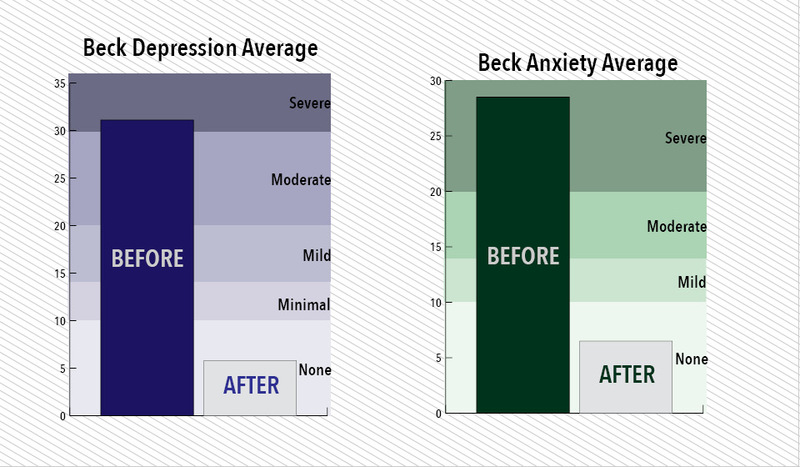 As a program average, the Beck Depression scores were severe before the program. The after scores showed a 24.5 point improvement with the average being at no depression. 11 out of 18 patients came to the program with severe depression, 8 out of those 11 left with no clinical depression at all. Within two weeks of coming to the program, 14 of the 20 February patients came in with suicidal thoughts or thinking, at least at times, that they would be better off dead, but they agreed that they were not planning on ending their life despite these thoughts. 6 of the 20 patients struggled with depression and anxiety but were not thinking of ending their life or that they wanted to die. The program does not admit patients who are planning on ending their life immediately. Such patients must go to their local ER or law enforcement officer to be committed to a lock up psychiatric facility. After being discharged from such a facility, these patients can qualify for participation in the Nedley residential program. Of the 14 patients who were having these worrisome morbid thoughts, we saw an incredible improvement within the 10 day duration of the program. Before the program: I couldn't even think 24 hours in the future. Some days just going out to the mailbox was a victory for me. You can imagine the impact that had when you have 5 young kids. It has obviously affected my entire family. Thankfully, my wife and children have been so gracious. My sweet kids often saw me crying. I would feel a little hug, and then another, and soon they would all be around me. This probably happened a dozen times. I knew that I needed to do something – something had to change. My experience at the program: My wife had been pushing the plant-based diet and pretty much everything else that Dr. Nedley and the staff laid out for us at the program. The first time I talked to her on the phone, maybe a day into the program, I just said, "I am so sorry! You've been telling me." In that moment it clicked. The Lord was preparing me because He knew that had she not exposed me, I would've really struggled to make the changes I have made. But because I had been exposed, my heart was softened, and I was ready. Within the first two days, I started to make some commitments. I started out being willing to just try the vegetarian stuff; I wasn't going to give up the eggs and the cheese though. By the next day I was willing to maybe go plant-based, but I told myself that whenever we have a big dinner at my parents' house, I will eat meat and whatever else. But the more I saw the fruits of following the plan, the stronger my commitment has become. I am 100% committed to all the puzzle pieces: the spiritual aspect, the physical exercise, the plant-based diet. I cannot ever go back to where I have been. I know that is the key. What I'd like to tell the others: I have a firm testimony that the work being done here is the Lord's work. For the first time in probably 20 years, I am confident in the brightness of my future. I am not saying there won't be down days, but now I have the tools to handle them. The CBT for me, along with everything, has just been a revelation. It feels like the sunshine coming in the room. It feels like I have had my blinds closed for years and now I can feel light and vitality. With these tools, I know that I can weather whatever storm may come. Right before I came in here, I saw saved in my notes a little fortune cookie paper I had seen on my way to the program that said something so simple but so encouraging. The note reads, "The best is yet to come." And I don't have any doubt. *this story has been slightly edited for clarity. "All 19 participants that entered the program with major clinical depression showed significant improvement dropping down at least one classification of clinical depression on the PQ-9 test. (ex. from severe to moderate), with 83 percent (10 of 12 that had severe depression) dropping from severe depression to no depression whatsoever." This program showed amazing results with 15 out of 19 leaving with no clinical depression after just 10 days. 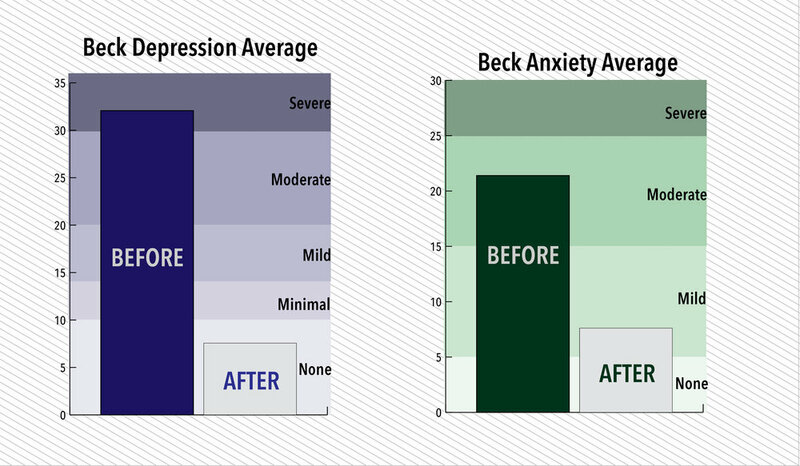 As a program average, the Beck Depression scores were severe before the program. The after scores showed a 25 point improvement with the average being at no depression. 13 out of 19 patients came to the program with severe depression, 11 out of those 13 left with no clinical depression at all. As a program average, the Beck Depression scores were severe before the program. The after scores showed a 19 point improvement with the average landing right in on the border between mild and no depression. 0 left with severe depression. Before the program: Life before for me was an existence where I was actually already endeavoring to put into practice these very principles the program is built on. However, I just had been unable to successfully do that on my own and I was rapidly losing altitude, and even the desire to continue to try and I found myself crying. I could just see everything coming apart inside of me. 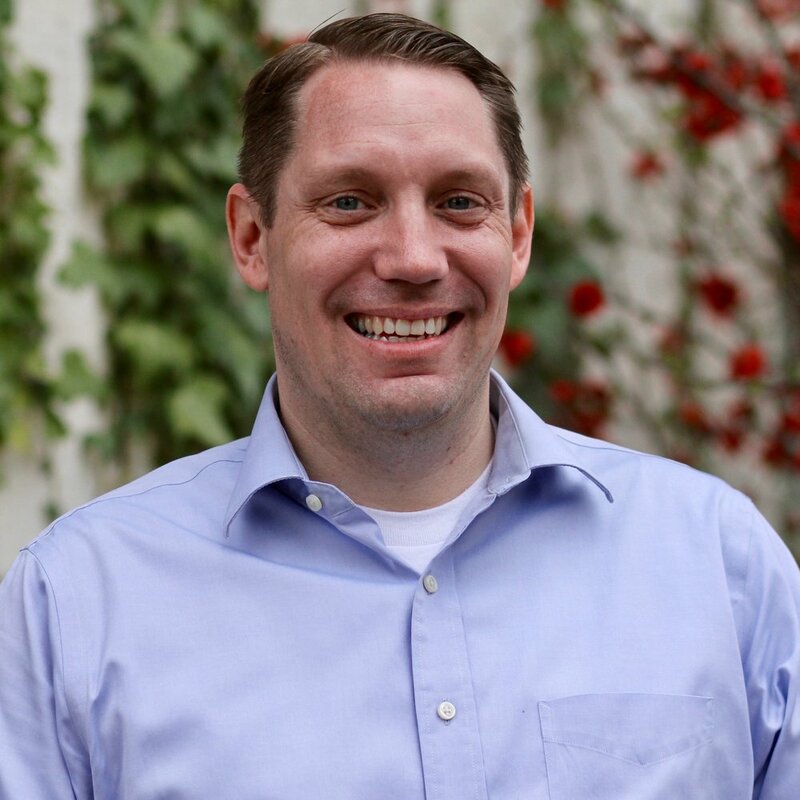 My experience at the program: At the program I found myself immersed in and saturated with truth, statistics, facts, personal testimony, love, acceptance, encouragement, and step-by-step instruction and help from all of the staff involved. Everyone was focused on the one main goal of my individual successful recovery from all that had held me back all of my life. What I'd like to tell the others: What I'd like to tell others is that you are not alone and that you don't have to try and figure all this out or do it all on your own any longer. As a matter fact you can’t. So come to this residential program. Find true family. Find very real help and ultimately your father and creator God both in theory and in action.